In Yunnan, almost all Pu-erh shops have Stupa-shaped Pu-erh to show their customers - symbolizing bounty and prosperity. 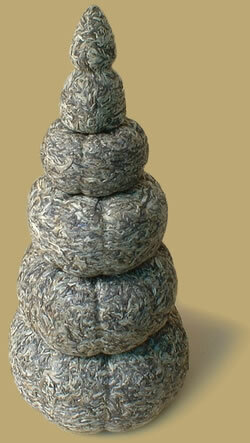 We are delighted we can make this wonderful Pu-erh Stupa available to you here. This is a raw Pu-erh melon stack, has a high concentration of silver buds, approximately 18 inches (45 centimetres) high, 5 kg (11 lbs) of high quality Pu-erh, made by hand in the traditional way. Some aged Pu-erh sell for more than $1000 a pound, it is hard to verify the age that claim to be, if you own it yourself you know the real age. Great for Pu-erh lover, collector or store display. PREPARATION: To prepare Pu-erh tea from compressed Pu-erh, it is best to use a strong knife to carefully pry out the desired amount leaves and place in a teapot. Rinse by covering with boiling water and quickly pour off. Cover with boiling water again and let steep 5-30 seconds (depending on how light or dark you want the tea) and serve. Pu-erh tea can be steeped 10-20 times.